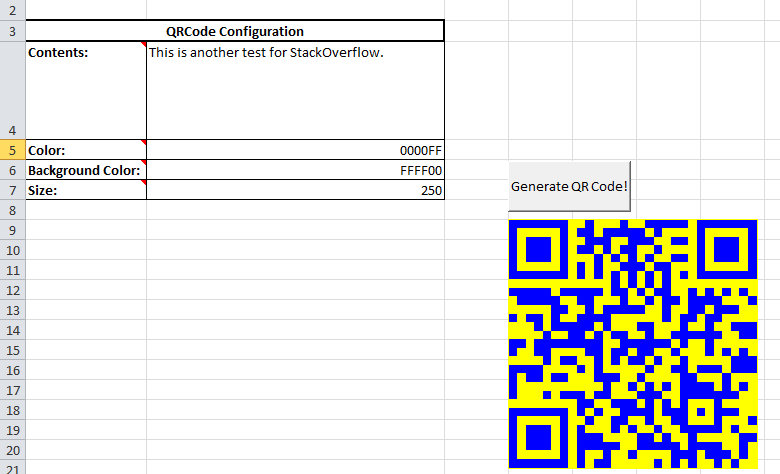 I would like to generate a 2d barcode (PDF417 or QR codes) in an Excel cell using macros. Just wondering is there any free alternatives to paid libraries to do this? I know certain tools can do the job but it is relatively expensive to us. The VBA module barcode-vba-macro-only (mentioned by Sébastien Ferry in the comments) is a pure VBA 1D/2D code generator created by Jiri Gabriel under MIT License in 2013. The code isn't completely simple to understand, but many comments have been translated from Czech to English in the version linked above. 1 is for graphical mode. The barcode is drawn on a Shape object. 0 for font mode. I assume you need to have the font type installed. Not as useful. 0 is the parameter for the particular barcode type. For QR_Code, 0=Low Error Correction, 1=Medium Error Correction, 2=Quartile error correction, 3=high error correction. 2 only applies to 1D codes. It's the buffer zones. I'm not certain what it does exactly but probably something to do with the 1D bar spaces? & "$" & Right(cellLocation, Len(cellLocation) - 1) & "#GR"
QRLabelName = QRShapeName & "_Label"
s = "BC" & xAddr & "#GR"
xBkgr.Name = "BC" & xAddr & "#BK"
Just input the worksheet name, cell location, and the QR_value. The QR shape will get drawn at the location you specified. I know this is quite an old and well-established post (though the very good existing answer has not been accepted yet), but I would like to share an alternative that I prepared for a similar post in StackOverflow in Portuguese using the free online API from QR Code Generator. It gets the job done by simply (re)creating an image from the URL built from the parameters in the cells. Naturally, the user must be connected to the Internet. Not the answer you're looking for? Browse other questions tagged excel vba fonts barcode or ask your own question. How to generate QR code for excel data? How to use TCPDF to generate a PDF417 2D barcode? How do I generate a PDF417 Barcode with Java4Less?